This is the kind of family lodge I’d love to spend a cold, snowy day like today in. And even though it’s a big one, the rooms look pretty cozy with the stone fireplaces and fir beams and wide oak-planked floors. Grab yourself a hot drink and let’s take a look around! The double-sided rock fireplace climbs 22 feet. The architect Kipp Halvorsen says, “Capturing the views is the main purpose of the house. The island countertop is solid walnut, while the rest in the kitchen are soapstone. The cabinets are reclaimed oak. 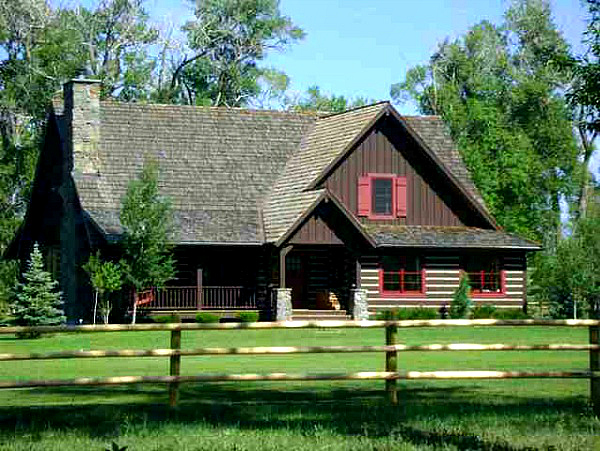 The family lodge was featured in Mountain Living magazine in a story written by Norman Kolpas last year. Visit their site for more photos and information about it. You can find additional source info about the family lodge in the mountains at Home Bunch. Photos by Gibeon Photography; architecture by Faure Halvorsen; interiors by Peace Design; construction by Highline Partners. Looks cozy! I would love to have a cup of coffee next to that fireplace. Enjoy your snow day! We managed to escape this round of snow in North Carolina, but I feel sure we’ll get our share. Love this home and yes it’s large, but somehow manages to feel warm and cozy with all of the rustic wood and stone. Wishing you all the best in 2014! I have being trying to leave comments but I was having some problems. I hope this works this time around. Also, thank you so much for sharing this with your readers. I was thinking about this home when I went to bed last night (bloggers, I tell ya! )… this is one of my favorites in a long time. I love how warm it feels. Hi Luciane! I’m not sure why your other comments didn’t come through. I’m not seeing them so they may have ended up in the spam folder (sorry about that!). The kids do grow up fast. Lily is a 6th grader now and Jake is in college. It’s been great having him home for winter break with us. I’m not generally drawn to rustic homes, but this is cabin perfection (OK, more like crazy cabin-mansion perfection)! I’m sure I could easily snuggle up for a long winter’s nap in one of those cozy spaces! That two digit Wyoming licence plate is pretty comical. The low digit Wyoming license plates are badges of honor … as are the original exchanges for phones where you can give you number to someone by telling them to call you at 4486. 🙂 Glory days of the old west. Be still my heart !!!!! This home takes my breath away. Luvvvvv the sliding barn doors, beautiful beams and wood planks…..the sweet fireplace in the bathroom…..heaven. The decorating is so relaxing & unique with the movie posters, license plates, rustic bathroom sink and bunk beds. What more can I say….It’s beautiful. Love. Really grand but cozy. I have pics of this pinned to my mountain home notebook. I’m afraid our mountain log cabin is a long way from this, but I love seeing rustic done beautifully. A very cold snowy morning on ‘our’ mountain today after an incredibly windy night. Fortunately only lost power for an hour. Stay warm. I guess I’m alone in this, but this place looks downright spooky to me in the evening photos. I like it alright in the daytime, but those downlights making all the shadows on the stone, along with the iron curtain rods, metal stair railing, and what looks like bars across an opening under the stairs – dungeon is what comes to my mind. Just discovered your blog-site this week…. I’m in heaven! I am also ‘hooked on houses’ and will spend hours, literally looking at them whenever and wherever I can find them. I’m way down here in South Texas, so no snow and not much cold. Believe I found you thru Joni @ Cote de Texas! Keep up the great research and wonderful pictures, I’m loving it! This is unbelievable! It’s absolutely breath taking! I could look at the pictures for hours and study all the details! Thanks for sharing. Wowzers! WOW-zers! There are so many spectacular details to swoon over in this home. My favourite are those gorgeous “barn” doors. I love them. I always try to imagine how I could incorporate into my own home but I think one has to have a certain type of home to pull them off décor-wise. The rustic feel of this home is cozy and inviting and I can only imagine how serene it must be to wake up to the snowy views of this home. It’s -31*C here and I’m on my 4th cup of tea this morning. Your new blog post has been a welcome respite from the cold day ahead. Stay warm, Julia. Negative 31? Whoa! I don’t think I’d get out of bed if it got that cold. I’d be drinking my tea under the covers. Ha. Thanks, Jennah! I thought I was over log homes, but I’m clearly not. I like the balance of logs, dry wall and stonework. I really like the bunk room, it’s a good use of space. Gorgeous place! This is the kind of mountain house I have dreamed about having many times. I love your instragram page. You take nice pictures and it’s fun to see what’s going on with your family. Have a good year Julia! Wonderful place I’d like to visit and spend winter holidays of course; it reminds me about the ranch that Andie McDowell once owned in Montana with her first husband. I still have beautiful pics of it from a magazine but couldn’t find some on the web unfortunately… I’ll e-mail them to you this week end; I’m sure you’ll love them! And…Happy New Year! Bonne Année! Ooh, yes, I’d love to see it. I loved her Tudor in North Carolina. Thanks, Cecile! This is spectacular! Very inviting at the moment, as the temp here is currently dipping down to frightful lows. We’re still on holiday and the kids are so tired of being cooped up. It’s too cold to spend time outdoors. A fireplace in the bathroom is the ultimate luxury to me. i would love that house just for the fireplace by the bathtub!! heaven! while, i don’t love the furninishings so much in the bunkroom, i do really like the idea of a bunk room with a living area. Forgive me for posting this question here, comments closed on the Parent Trap 1961. Might I ask for your opinion on the staircase of the Boston home. It appears to perhaps be the same staircase used in the Griswold Christmas Vacation. What do you think? They do look similar! I’m not sure if they’re the same ones or not, though. Interesting observation! I absolutely love this house. This home is rustic and elegant at the same time. I love it! I have seen this house on houzz and always save the pictures. This is one beautiful home! Happy New Year Julia ! Thanks, Julie! Same to you! Am I seeing bunk style beds at the far end of the living room? In a house so large I don’t understand why. Nice place to hibernate for the winter though. It’s a bunk room for the kids. How fun is that? Well, aren’t they lucky kids; that’s not your average bedroom! !